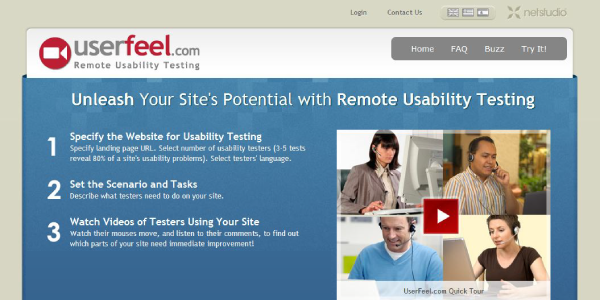 Userfeel.com is a company that provides user testing for those wanting to know what they need to do to make their website more useful to the user. Website owners pay to have testers use their site while they watch their mouse clicks around the site and listen to their comments . Testers are given specific tasks to accomplish while on their website, provided by the owner, and they are asked to provide written answers to certain questions that will be provided to the client after the test. As a tester, you must have a computer and a microphone. You are expected to complete the tasks requested by the client and make audible comments as you do so. You will then have to answer the written questions at the end to be provided to the client and these should be answered thoroughly. The application process requires a sample test be done, and the sample is rated on a scale of 1 to 5 based on how useful your test is. There are lots of tips on the website regarding what to do and what not to do during a test to make it as useful as possible to the client. The idea is to provide the client with the best information possible to improve their site for their users. You are paid $10 per test weekly via PayPal. It seems most tests take around 15 minute best I can tell, but they could be longer in certain cases. The real issue is job availability. You receive e-mail notification when you are assigned a job and have a certain amount of time to do it after you accept. If you do not accept within a certain amount of time it is reassigned, and the number of tests you are assigned is directly related to your ranking on the sample in the beginning. Subsequently you are graded by the client on each test and the higher your grade the more work you get offered. Other factors, such as demographics, can affect assignments as well. The website states that they do not suggest you quit you day job, but that with good work and depending on assignments available you could may $100 to $200 per month. However, it appears many have not been receiving assignments lately, and this has been the case for most of 2012. They are not currently accepting applications for new writers either. Basically, this is definitely one to keep an eye on as a very useful egg. When they open up new tester applications again, it could not hurt to do the sample test. If you enjoy it and you are good at it, this is definitely a legitimate egg to add to your work-at-home basket.